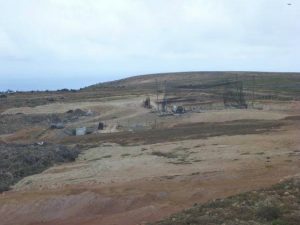 Horse Point Landfill Site (HPLS) is open to the public 24 hours a day – 7 days a week, including Public Holidays (it is advisable not to use the site during the hours of darkness). For your safety please comply with signage and any instructions given by Staff on site. Domestic and Commercial waste collections are land filled in a netted cell, this is designed to reduce the opportunity for pigeons to feed on kitchen waste. Pigeons can be a hazard to low flying aircraft, so composting kitchen waste contributes towards minimizing ‘Bird Strike’ risk, whilst reducing the volume of organic waste to landfill. HPLS includes two geo-lined and leachate proofed hazardous waste cells, which are fenced and gated, for the safe disposal of certain hazardous wastes. 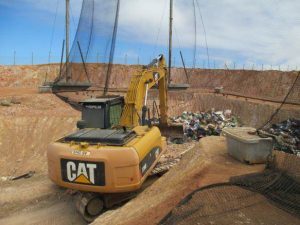 Wastes disposed within these cells include; oil from Power Station diesel generators (decanted into 22000 litre tank-tainers located in the cell), motor and cooking oil (in 1000 litre containers), paint, agricultural chemicals, vehicle and domestic batteries. HPLS facilitates the disposal of hazardous wastes which is carefully managed on site to prevent negative impacts on human health and/or the environment. This is only possible if hazardous waste is delivered to the site in a safe manner. 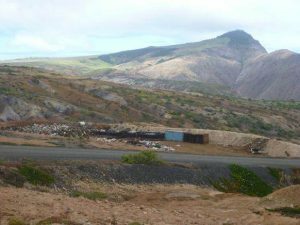 Hazardous Waste will only be accepted at Horse Point Landfill Site by prior arrangement with Landfill Manager, Patrick Crowie, on tel: 23655 or by email: landfill.manager@helanta.co.sh. Solid or powdered hazardous waste: wrapped and sealed, then wrapped and sealed a second time with the outer wrapping labelled with the name of the waste and marked as ‘HAZARDOUS’. Asbestos: must be double wrapped and sealed in heavy duty plastic and marked as asbestos and ‘HAZARDOUS’. Liquid hazardous waste: sealed in an appropriate container, labelled with the name of the waste and marked as ‘HAZARDOUS’. For all hazardous wastes, a copy of the Material Safety Data Sheet must be supplied with the waste, and submitted to the Landfill Site staff upon arrival at HPLS or by emailing the Landfill Manager in advance of the hazardous waste delivery. Vehicle batteries, small amounts of waste oil (including cooking oil) and paint: can be safely disposed into the appropriate containers within the Public Recycling Facility without prior arrangement with the Landfill Manager. For the disposal of larger quantities of waste oils and paints, please contact the Landfill Manager. The public are advised that all deliveries of hazardous waste to HPLS must be in line with the above procedures. Failure to adhere to these procedures may result in the hazardous waste being refused disposal. Any hazardous waste spills on site must be reported to Landfill Staff immediately. 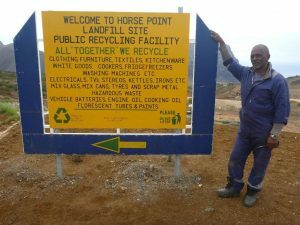 In 2016, WMS, working in collaboration with CNSKB Trading, commenced glass waste recycling operations at Horse Point Landfill Site (HPLS). CNSKB Trading voluntarily undertakes glass waste recycling. This has proven to be successful, and environmentally beneficial. The reduction of glass waste volume to landfill has been evident across waste composition analysis calculations – the ‘waste wheel’ – with 18.84% in 2016, down to 9.17% in 2017. Members of the public who wish to dispose of larger quantities of glass waste for recycling or would like more information are invited to contact CNSKB Trading – Mr Chris Bargo on telephone number 23163, after 5pm. Reducing and reusing more, to reduce waste, saves you money and helps us all by making the landfill site last longer.